New siding can significantly improve the look of your home, increasing your home’s curb appeal and resale value, while protecting your home from the elements. According to the 2016 Cost vs. Value report, replacing your siding can yield a 77% rate of return on your investment. Additionally, adding insulated siding to your home is a cost-effective way to keep your monthly energy bills lows. Home siding comes in an array of materials that offer varying benefits, all at various price points. Additionally, advances in vinyl and veneer siding allow you to create the more expensive look of stone, brick, and cedar shake without the high cost. Rotting: If you have wood siding, look for brittle sections that have begun to crumble or are on the verge of crumbling–you’ll notice these sections typically look dull compared to siding in better condition. This is a sign that moisture has begun to penetrate your siding, breaking down the properties that give wood its strength. Untreated, rot will lead to further decay. Warping: Examine your home from multiple angles to check if there are portions of your siding that are no longer flat compared to adjacent panels. This is a sign that serious damage, including rot, may be present beneath the surface. Cracking: Visible cracks on any siding material create an entry points for moisture and pests. You may want to consult a professional to inspect the depth and severity of your cracks to determine whether patchwork will suffice or if total siding replacement is necessary. Holes from insects or birds: It can be difficult to spot small insect-caused holes in your siding, but if you encounter a series of carved patterns or see insects moving in and out of a small opening, you may have a more significant problem. Look for holes from birds much higher from the ground. Unexpectedly High Energy Bills: A surge in your monthly utility bills may indicate that air is passing through your home. Check your windows and exterior door frames. If you don’t find leaks there, your siding is the most likely culprit. Interior moisture: If you find traces of moisture, mold, or mildew inside of your house, be sure to investigate the condition in the same area on the exterior. You may need to update your home’s insulation as well as the siding. Vinyl: Vinyl siding is weather and insect proof, fade resistant, and very durable under most circumstances. Of all the various types of siding, vinyl is the most affordable to install (between $4.60-$6.27 per square foot) as it can be applied directly over almost any existing surface, including brick and stucco. Vinyl’s low price point and its extraordinary durability make vinyl siding the most popular option for homeowners in North America. Increased options in size, texture, and color in recent years has only made vinyl siding more popular. Vinyl siding is virtually maintenance free, only requiring simple cleaning to prevent the growth or mold and to remove dirt. Fiber Cement: If you’re looking to make an environmentally sustainable choice–not to mention a good long term investment, fiber cement siding may be for you as it will last a lifetime (50+ years). It is important to note though that unlike wood siding, installing fiber cement siding is not a DIY project, hence the upfront installation cost is considerable (between $5-$10 per installed square foot). That said, once installed maintenance is limited. Most manufacturers recommend refinishing every 15 years to maintain your warranty. Fiber cement siding provides excellent protection from the elements, pests, and noise pollution. Fiber cement siding can be produced in virtually any color. It also comes in a variety of styles including: lap, plank, vertical, shake, curved shake, and various geometric patterns. Fiber cement siding can also be manufactured to mimic the look of wood, stone, or brick. Wood: Wood siding creates a classic look in the form of clapboard, lap siding, shakes, or shingles. Wood siding is less popular with homeowners as it does require regular maintenance including treatment to prevent termites and improve flame resistance, as well as regular painting and staining (on top of the cost of the product and the installation which ranges between $5.72 and $7.85). When properly maintained, wood siding can last up to 30 years. Damaged panels are typically easy to repair, but it is important that they are replaced before damage like rot has the opportunity to spread. More expensive types of wood like cedar and redwood are more decay resistant than other types of wood siding and typically last longer. Clapboard: Clapboard is a type of wooden siding typically made from split oak, pine, or spruce. It costs between $5-$6 per square foot. Pricier (and more durable) options are available in red cedar and pine. Clapboard siding can be identified by its thickly cut, overlapping boards. Boards are applied like shingles to the home’s exterior with the thin side underneath the thick edge creating a wedge. Once installed, clapboard can be left unfinished or can be stained and painted. Clapboard comes in a wide variety of styles, finishes, and textures. With proper maintenance and care, clapboard siding can last for many years. Maintenance includes periodic painting, staining, and caulking as well as removing and repairing rotted or damaged boards. It is recommended to paint or re-stain every four to six years and to apply fungicide and mildew retardants every three or four years, especially in warmer climates. The look of clapboard can also be created using fiber cement, aluminum, and vinyl siding. Cedar: If you like the look of wood siding, cedar is probably the best option you can select. Cedar siding is both firm and stable, outlasting other wooden siding options and providing excellent protection against rain, wind, snow, and sleet. While most wood siding rates relatively poor when it comes to resistance to moisture, cedar is one of the best options available for keeping out rain and moisture. In this respect, though the initial installation cost of cedar may be higher than other wood siding, cedar siding can save you money in terms of not having to replace shingles or panels because of its increased durability. Cedar siding can be applied in the form of horizontal lap panels or traditional shingles or shakes. You can also get a more modern, seamless look with tongue-and-groove panels, or create a rural look with board-and-batten. Cedar siding can be painted or treated with stain, oil, or even left untreated. Cedar Shake: Cedar shake creates an incredibly beautiful, rustic look for your home. Depending on where the wood originates from, cedar shake can range in colors and grains. Depending on how the shake is placed, a number of different textured wall types can be created. In terms of sustainability, cedar shake will biodegrade naturally and cedar trees grow rapidly, decreasing the impact of your siding on the environment. Cedar shake cost $6-$8 per installed square foot. Hardie Board: Hardie board is a type of fiber cement siding created by James Hardie, the founder of fiber cement in the 1970s. This brand is especially committed to sustainability—sourcing 90% of their materials from regional suppliers, and employing waste minimization and solid waste recycling technologies to support Zero to Landfill initiatives. Like fiber cement siding, hardie board siding is completely rot and insect resistant and can even handle salt spray from the ocean. Hardie board is made of of 90% sand and cement which make it very fire-resistant. Most hardie board siding comes with a 50-year, limited transferable warranty. Hardie board cost between $8-$12 per installed square foot, but it can be made to mimic many other types of siding including wood lap boards, cedar shingles, and wood shake siding. Color options are also virtually unlimited. Aluminum: Aluminum siding is one of the more cost-effective materials on the market ($3 to $6 per square foot) and you can expect it to last at least 40 years. Installation is relatively simple, making it a project that you may be able to take on as a homeowner. Aluminum siding stands up well to weather and corrosion, though it can dent or scratch relatively easily. That said, panels can be replaced or painted to maintain the look of your siding. Stone: Natural stone siding creates a stunning look for your home. It is extremely durable being resistant to rot, pests, fire, and the elements, as well as lasting the lifetime of your home. The heavy weight of the stone can make installation very expensive ($15-$30 per installed square foot) and also put undue pressure on the structure of your home. You’ll need to have your home evaluated to ensure that it can handle the weight. Asbestos: Asbestos siding was very commonly used in buildings and homes from around the 1920s through the 1980s, and can still be found in many older homes in North America. Asbestos siding was made by adding asbestos to Portland cement. That cement was then pressed into siding shingles that came in a wide variety of sizes and textures. The resulting product was very durable, fire-resistant, and absorbed paint well. That said, asbestos siding can be extremely dangerous to your health if the siding is broken up and asbestos fibers are released into the air. In 1989, the EPA banned asbestos in building products. If you are considering purchasing an older home, you’ll want to find out immediately whether or not you have asbestos siding. If you do, you’ll need to weigh your options–the cost of asbestos removal versus the health risks of disturbing it during removal. If you choose to remove the siding, you’ll also have to ensure safe disposal of the siding. If you choose to keep the asbestos siding, you’ll need to safely encapsulate the asbestos siding with new vinyl siding or another material that might aid with asbestos abatement. Brick: Brick siding creates a traditional aesthetic for your home, available in many sizes, colors, and textures. While the initial installation cost may be high ($6-$15 per square foot), brick is durable. Brick siding won’t rot, burn, or fade and may even lower your homeowner’s insurance rates. There is no maintenance required for the first 25 years, at which point you should begin inspecting mortar joints as masonry does deteriorate. Brick siding may even have a positive impact on your monthly utility bills, as homes with brick siding effectively cool your home during extended periods of hot weather. Faux Stone: Natural stone is beautiful and durable, but it is also very costly. If you’re looking to achieve a similar look that you can install yourself, faux stone panels or stone veneer may be great options for you. 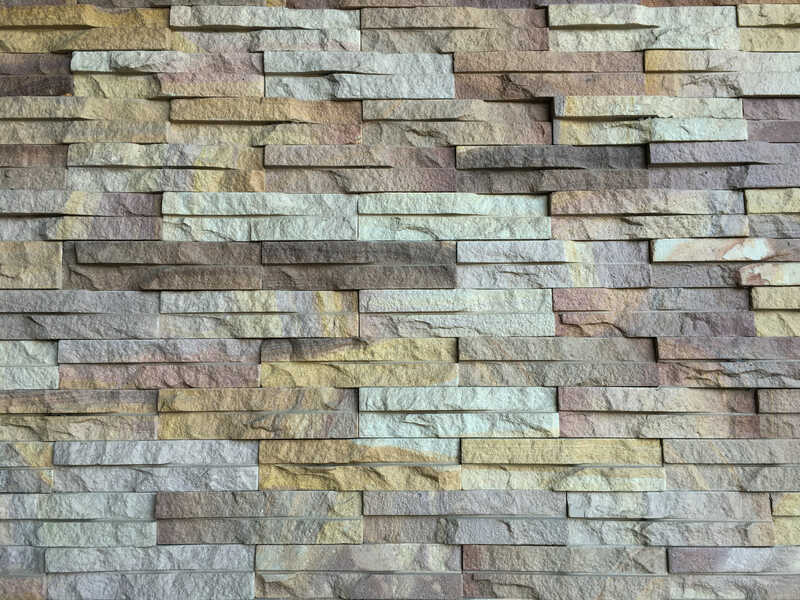 Faux stone or stone veneer comes in sheets of lightweight panels, usually weighing no more than 11 lbs, and can be installed by anyone with basic carpentry skills. With a standard hand saw or circular saw, faux stone panels can be cut to size and shape, while cutting natural stone would require more sophisticated equipment. Faux stone and stone veneer create a look for your home that is incredibly similar to real stone and the cost is considerably less–$5 to $10 a square foot cheaper. That said, though the look is very much the same, faux stone and stone veneer siding does not offer the durability of natural stone. Made from concrete, faux stone breaks much more easily than natural stone. Engineered Wood: Engineered wood siding is the generic term for hardboard and plywood made into 4×8-foot sheets or lap panels. It is available in smooth or embossed textures and cuts and handles like real wood. Engineered wood siding is relatively inexpensive–$1.50-$3 per square foot, but in terms of durability, exposed cuts or edges can quickly weather and decay. You can expect your engineered wood siding to last between 20-30 years if regularly maintained with painting every 5 to 10 years.